Tales of deceptive vampire-witch covens, magic-wielding sisterhoods, conjoined twins and spirit world communicators are just some of the denizens readers encounter inside the third edition of Lilac City Fairy Tales, being released during a special fundraiser event this weekend. The anthology's latest volume features short stories and poems by nearly 80 contributing writers from the Inland Northwest and beyond — some are widely recognized local authors; others are publishing for the first time — and is subtitled Weird Sisters. Proceeds from the collection's sale, and tickets to its launch event at the Bing Crosby Theater, benefit programs at Spark Central, the community literacy and resource center aimed at providing creative and educational opportunities to youths from Spokane's West Central neighborhood. "We continue to support them because they're a great and vital community center in a neighborhood that needs it," says project organizer and local author Sharma Shields. "And, you know, they put on so many great literary events and programs for kids." 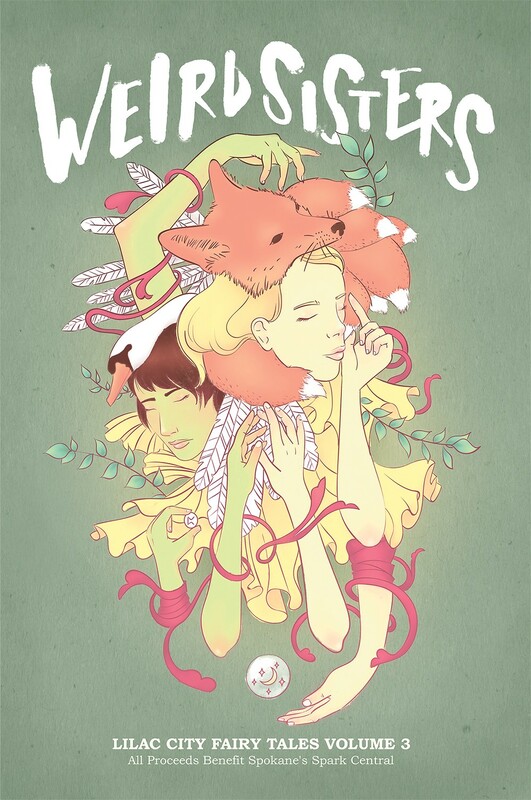 Work featured in the 250-page anthology both loosely and directly falls under the collection's "Weird Sisters" theme. These stories range from realistic portraits of sibling relationships to fantastical or modern reimaginings of the otherworldly beings and parables that populate classic fairy tale lore. "We always get a little bit of a mix, and we really want a lot of variety in the anthology," Shields says. "If people aren't really into fantastical writing, they don't have to write that way, and we have beautiful pieces" written in each style, she adds. Most of the pieces contained in the collection are by women writers, but this designation didn't exclude others from contributing. The volume's cover art and page design was created by local designer Keely Honeywell, and the submission review panel consisted of all women actively involved in the literary arts community. "We received more than twice the amount of submissions than last year," Shields notes. "I feel like it really does get better and fuller every year, and longer." For the collection's launch, featured contributors to the book are slated to read their pieces on stage. Local folk musician Caridwen Irvine-Spatz also will perform original music inspired by the fairy tale genre, and the audience is treated to a performance of Scene 1, Act 1 of Macbeth — featuring the three witches, aka the "weird sisters" — directed by Sara Edlin-Marlowe. Afterward, find the collection for sale ($15) at Auntie's Bookstore, Spark Central, and Atticus Coffee & Gifts. Copies can also be ordered online at scablandsbooks.org.